Presidential elections were held in Finland on 28 January 2018. The incumbent Sauli Niinistö received 62.7% of the vote and was elected for a second term, avoiding a second round. The term will be from 1 February 2018 to 1 March 2024. Although the President is elected by direct election, Niinistö gained a plurality in all municipalities and a majority in all but 13 municipalities. The next most popular candidate and Niinistö's most popular competitor in the previous elections in 2012, Pekka Haavisto, received 12.4% of the vote. (1996–2007, since 2015) Haatainen was Minister for Education in the short-lived Jäätteenmäki Cabinet and retained her post in the subsequent Vanhanen I Cabinet. After that she was Minister for Social Affairs and Health from 2005 to 2007. (1987–1995, since 2007) Haavisto ran in the 2012 presidential election and reached the second round of voting, but lost to Sauli Niinistö of the National Coalition Party. Prior to the campaign he had been an MP since 2007, and had worked for the United Nations from 1999 to 2005. (since 2015) Huhtasaari was elected to the Parliament in 2015 with 9,259 votes, and was elected vice chair of the Finns Party in June 2017. In the Parliament, she also has been member of the Legal Affairs Committee, the Education and Culture Committee and the Finnish Delegation to the Nordic Council. (since 2014) Kyllönen served as Minister of Transport in the Katainen Cabinet from 2011 to 2014. She ran for the European Parliament in 2014 and was elected. The incumbent President of Finland ran as a member of the National Coalition Party in 2012 after narrowly losing in 2006. For 2018 he decided to run as an Independent to "test his support" among the public. He gathered 156,000 signatures and his candidacy was confirmed on 25 September. (since 2012) Former member of the Communist Party of Finland, Torvalds worked at the Swedish-speaking department of the Finnish Broadcasting Company (Yle) from 1982 to 2004. He joined the Swedish People's Party of Finland in 2006 and was elected its third vice chairman in 2007. He ran for European Parliament in 2009 and wasn't elected, but he acceded to the position in 2012 after Carl Haglund resigned. (2003) Former Prime Minister ran in 2006 and got 18,6% of the vote. He left politics after his tenure as Prime Minister, but returned in 2015 when he was re-elected as an MP. Veteran politician Väyrynen has run for President as a Centre Party candidate three times; in 1988, 1994, and 2012. He quit the Centre Party in 2016 and founded his own Citizens' Party. The incumbent President Sauli Niinistö successfully sought another term as an independent candidate. The incumbent President Sauli Niinistö was elected as the candidate of the National Coalition Party in the 2012 election. He was eligible for re-election and his decision for running again was closely followed throughout the latter half of his first term. On 29 May 2017, Niinistö announced that he would seek support for his candidacy as an independent candidate outside party politics. To become an official candidate, Niinistö needed 20,000 signatures from his supporters. Niinistö eventually gathered 156,000 signatures and his candidacy was confirmed on 25 September. Soon after Niinistö's announcement, the leader of the National Coalition Party Petteri Orpo tweeted that Niinistö has the party's full support. Former Prime Minister Matti Vanhanen was the Centre Party's candidate. The Centre Party decided on 30 November 2015 that the party would choose their presidential candidate already in June 2016. Soon after, former Prime Minister and Centre Party's presidential candidate in 2006 election, Matti Vanhanen, announced that he would run for candidacy. Prime Minister Juha Sipilä declined his interest early on. Other prominent names in speculations for the candidacy were the former Prime Ministers Esko Aho and Anneli Jäätteenmäki, and former Minister of Economic Affairs Olli Rehn. Rehn declined the possibility stating that it wouldn't be possible to combine his duties as cabinet minister with campaigning. Aho did not comment his interest in candidacy, but it was considered unlikely for him to seek presidential nomination, as he was a candidate for the Supervisory Board of Sberbank at the time. Jäätteenmäki, an incumbent Vice President of the European Parliament, said running for President was "not on her agenda". As no challengers appeared till the deadline of 11 May, Vanhanen was the sole candidate in June's party congress and was confirmed as the Centre Party's candidate in the presidential election. Vanhanen has said that his candidacy is motivated by the support he felt he had around the country during his last campaign and the will to improve the security situation in the areas surrounding Finland. Finns Party MP Laura Huhtasaari was nominated as the party's candidate. The Finns Party is likely to confirm their candidate in summer 2017. The leader of the Finns Party Timo Soini announced early on in November 2014 that he would not seek candidacy in the 2018 presidential election, after getting 3,43 % and 9,4 % of votes in 2006 and 2012 presidential elections respectively. He reaffirmed his decision in April 2016, encouraging party to move on and inviting new faces to enter party's primaries. As Soini had been a strong face for the Finns Party, his decision sparked much speculation on the party's decision, as party's presidential candidate was expected to also follow Soini as the chairman. In March 2017, Soini announced that he would not seek another term as the leader of the party. Soon after, the chairman of the parliamentary group Sampo Terho announced that he would seek chairmanship and, if elected, also presidential candidacy. Member of the European Parliament Jussi Halla-aho, Minister of Defence Jussi Niinistö and Speaker of the Parliament Maria Lohela did also express their interest in candidacy, while Minister of Justice and Labor Jari Lindström declined early on. However, only Halla-aho decided to also seek chairmanship in the leadership election. Choosing the presidential candidate for the party was on the agenda for party congress in June 2017. However, after Jussi Halla-aho won the leadership election, the decision was postponed by Halla-aho's request. A few days after the leadership election, twenty Finns Party MPs, including all cabinet ministers, defected to form a new parliamentary group under the name New Alternative. After the split, most of the potential presidential candidates had left the party. However, the newly elected vice-chairman Laura Huhtasaari and MP Tom Packalén announced that they were thinking about the candidacy. On 4 August 2017, Halla-aho announced that the board of the Finns Party had chosen Huhtasaari as the presidential candidate of the party, and her candidacy was confirmed by the party council on 23 September. On 19 June 2017, Sampo Terho announced that a new party would be formed based on the New Alternative parliamentary group under the name Blue Reform. The vice-chair of the Blue Reform parliamentary group Tiina Elovaara stated initially that the group was likely to have their own presidential candidate. However, as the party was formed after the previous parliamentary election and thus has no elected MPs, it would have required to gather a sufficient amount of signatures to set an own candidate. Thus, ultimately, the party decided not to put forth their own candidate and neither did it formally back any running candidate. The 2012 presidential candidate for Green League, Pekka Haavisto, reprised his candidacy. The party 2012 presidential candidate, Pekka Haavisto, announced in February 2017 that he will reprise his candidacy. The decision came after Haavisto had been approached multiple times by the Green Party. Previously the party leader Ville Niinistö, President Niinistö's nephew, had stated that he would not seek the candidacy. Haavisto was confirmed as the party's candidate on 12 February. 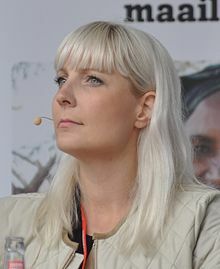 The Left Alliance chose MEP Merja Kyllönen as the party's candidate on 18 March 2017, after being the only one interested in running. Former leader of the party Paavo Arhinmäki was also interested in running early on, but later decided to concentrate on running for the office of Mayor of Helsinki. Social Democratic Party organised an informal membership poll in August 2017 for electing the party's presidential candidate, with three candidates entering the race, MPs Maarit Feldt-Ranta, Tuula Haatainen and Sirpa Paatero. The final decision based on the membership poll was made on 2 September 2017, when it was revealed that Haatainen had received the most votes in the poll. Haatainen ultimately gained 48.6% of the votes against Feldt-Ranta's 42.3% and Paatero's 8.6%. Before Feldt-Ranta, Haatainen and Paatero entered the party primary, Social Democratic Party was struggling to find potential candidates, as most of the prominent politicians had declined the candidacy. From early on, there was speculation on two possible candidates, Eero Heinäluoma and Jutta Urpilainen. In June 2016, Heinäluoma announced that he would not seek presidency due to his wife's recent death and ongoing work in the Parliament. In February 2017, Urpilainen also announced she would not seek presidency. The leader of the party Antti Rinne, the Governor of the Bank of Finland Erkki Liikanen and MEP Liisa Jaakonsaari likewise announced that they were not entering the presidential race. There were also talks within SDP on supporting a candidate outside the party, such as archbishop Kari Mäkinen, if no candidate would be found from within. Prominent SDP figureheads, such as Erkki Tuomioja and Lasse Lehtinen, even suggested the possibility of backing the incumbent president Sauli Niinistö. The Swedish People's Party decided to choose their candidate in the party congress in June 2017. As no one else entered the party's primary on 11 June, Member of the European Parliament Nils Torvalds was nominated as the party candidate. In Spring 2016, then leader of the party, Carl Haglund stated that he was thinking about candidacy, but renounced his leadership and left politics later that year. On 19 August 2017, the Christian Democrats decided to back the incumbent President Sauli Niinistö. It was previously speculated that the leader of the party and former presidential candidate Sari Essayah would run again. However, after Essayah announced that she would not seek the candidacy, the party convention decided to back Niinistö. Former Center Party politician and three-time presidential candidate Paavo Väyrynen announced that he would run as an independent candidate if he managed to gather the 20,000 signatures required from his supporters in time. By 26 November, he had gathered around 15,000 signatures. On 5 December, he announced that he had gathered the needed 20,000 signatures. The parties budgeted about as much for their campaigns than during the last presidential election in 2012. Ahead of the election, the campaign teams budgeted as follows: Niinistö 1,000,000–1,500,000 euros, Haatainen 550,000 euros, Haavisto and Vanhanen 500,000 euros, Torvalds 400,000 euros, Kyllönen 250,000 euros and Huhtasaari 200,000 euros. Väyrynen didn't leave the notion ahead of the election, but revealed afterwards that his team had collected 162,000 euros for the campaign. After the election, Niinistö announced that the 300,000 euros that were reserved for the second round would be donated to the charity. The first presidential debate was organised on 30 October 2017 by the Finnish Business and Policy Forum at Finlandia Hall. All confirmed candidates took part, excluding Kyllönen, who was on a business trip. The event marks the earliest moment that the incumbent president has taken part in debates. The debates continued at the University of Helsinki on 13 November, with Vanhanen being absent after being hospitalised for heart arrhythmia. As Väyrynen became an official candidate only in early December, he was not invited to the first three debates and thus the first debate, that gathered all candidates together, was organised on 13 December 2017. In October 2017, the Security Committee of the Finnish Ministry of Defence released an assessment on the possibilities of Russian involvement in the presidential election. The assessment addressed nine possible scenarios, ranging from spreading false information through social media to a political assassination. The Security Committee also suggested ten possible objectives for Russian involvement, including obstructing discussion on NATO and isolating Finland from the European Union. Long-time Minister for Foreign Affairs Erkki Tuomioja heavily criticised the assessment and called it "pure fantasy resembling something from the pen of Ilkka Remes". ^ "Vuosina 2016-2030 toimitettavat säännönmukaiset vaalit" (in Finnish). Ministry of Justice. Retrieved 17 March 2016. ^ "Sauli Niinistö jatkaa Suomen presidenttinä – kaikki äänet on laskettu". Yle Uutiset. ^ "Katso kartalta Niinistön kannatus kunnittain: Luodossa hän keräsi äänistä 84 prosenttia, Tervolassa reilusti alle puolet". Yle Uutiset. ^ "Presidentti Niinistö: Jatkohalut julki noin vuosi ennen vaaleja" (in Finnish). Yle. 28 February 2015. Retrieved 17 March 2016. ^ "Sauli Niinistölle 156 000 kannattajakorttia" [Sauli Niinistö gathers 156 000 signatures] (in Finnish). niinistö.fi. 25 September 2017. Retrieved 25 September 2017. ^ "Petteri Orpo twiittasi heti Niinistön jatkokausi-ilmoituksen jälkeen: "Kokoomus on täysillä mukana"" (in Finnish). Yle. 29 May 2017. Retrieved 29 May 2017. ^ a b "Keskustalta yllätysveto: Presidenttiehdokas jo kesällä - Sipilä kieltäytyy" (in Finnish). Suomenmaa. 15 March 2016. Retrieved 14 April 2016. ^ "Vanhanen lähtee presidenttikisaan ja luopuu keskustan eduskuntaryhmän johdosta" (in Finnish). Helsingin sanomat. 17 March 2016. Retrieved 17 March 2016. ^ Matti Vanhanen presidentiksi (in Finnish). Retrieved 2016-05-21. ^ "Eiköhän jo avata presidenttipelikin" (in Finnish). Helsingin sanomat. 4 January 2014. Retrieved 17 March 2016. ^ a b "Demarien presidenttipeli pyörii: Heinäluoma vai Urpilainen" (in Finnish). Iltalehti. 23 February 2015. Retrieved 17 March 2016. ^ "Olli Rehn ei lähde presidenttikisaan" (in Finnish). Ilta-sanomat. 3 May 2016. Retrieved 3 May 2016. ^ "Ex-pääministeri Esko Aho ehdolla huippupaikalle venäläispankkiin" (in Finnish). Ilta-sanomat. 17 March 2016. Retrieved 3 May 2016. ^ "Anneli Jäätteenmäki Suomen vaikeasta taloustilanteesta: "On aina niin helppo säästää toisten menoista"" (in Finnish). Ilta-sanomat. 20 March 2016. Retrieved 6 June 2017. ^ "Matti Vanhasesta keskustan presidenttiehdokas – kukaan ei ilmoittautunut haastajaksi" (in Finnish). Helsingin sanomat. 11 May 2016. Retrieved 11 May 2016. ^ "Matti Vanhasesta yksimielisesti keskustan presidenttiehdokas" (in Finnish). Iltalehti. 12 June 2016. Retrieved 12 June 2016. ^ Matti Vanhanen kertoo nyt, miksi hän haluaa Suomen presidentiksi (in Finnish). Ilta Sanomat. Retrieved 2016-05-21. ^ "Hänestäkö PS:n presidenttiehdokas? "En missään nimessä sulje pois"" (in Finnish). Verkkouutiset. 24 June 2016. Retrieved 24 June 2016. ^ "Timo Soini: En lähde enää presidenttiehdokkaaksi" (in Finnish). Apu. 28 November 2014. Retrieved 14 April 2016. ^ "Timo Soini ei pyri presidentiksi – "Puolueen on aika siirtyä eteenpäin"" (in Finnish). Ilta-sanomat. 14 April 2016. Retrieved 14 April 2016. ^ a b "Miksi eturivin perussuomalaiset ilmoittavat kilvan harkitsevansa presidenttiehdokkuutta? Kyseessä on taistelu Timo Soinin perinnöstä ja seuraajasta" (in Finnish). Helsingin sanomat. 2 October 2016. Retrieved 2 October 2016. ^ "Perussuomalaisen puheenjohtajaksi pyrkivä Sampo Terho väläytteli Suomeen EU-kansanäänestystä – "Se voi olla kynnyskysymys"" (in Finnish). Helsingin sanomat. 6 March 2017. Retrieved 6 March 2017. ^ "Halla-aho valmis harkitsemaan presidenttiehdokkuutta - "en lähde sen kanssa sooloilemaan"" (in Finnish). Iltalehti. 13 December 2016. Retrieved 14 December 2016. ^ "Halla-aho's bid for Finns Party leadership boosts interest in party membership". Yle News. Yle. 2 April 2017. Retrieved 17 June 2017. ^ "Perussuomalaiset lykkäsi presidenttiehdokkaan valintaa värikkäiden vaiheiden jälkeen" (in Finnish). Aamulehti. 11 June 2017. Retrieved 17 June 2017. ^ a b "Kaksi perussuomalaista harkitsee presidenttiehdokkuutta" (in Finnish). Demokraatti. 22 June 2017. Retrieved 22 June 2017. ^ "PS:n Tom Packalén harkitsee vakavasti presidenttiehdokkuutta: "Poliisikokemukseni myötä tunnen ihmisten erilaiset elämätilanteet"" (in Finnish). Iltalehti. 21 July 2017. Retrieved 21 July 2017. ^ "Perussuomalaiset aikovat asettaa kansanedustaja Laura Huhtasaaren presidenttiehdokkaaksi". Helsingin Sanomat. Retrieved 4 August 2017. ^ "Finns Party breakaway group to be named Blue Reform". Yle News. 19 June 2017. Retrieved 20 June 2017. ^ "Uuden vaihtoehdon lähtö presidentinvaaleihin on vielä auki". Iltalehti. 16 July 2017. Retrieved 17 July 2017. ^ "Siniset jättää presidentinvaalit väliin – ei asetu minkään ehdokkaan taakse". Ilta-Sanomat. 21 October 2017. Retrieved 21 October 2017. ^ "Vihreiden Pekka Haavisto lähtee presidenttikisaan – "Pitää katsoa eteenpäin seuraavaan sataan vuoteen"" (in Finnish). Helsingin sanomat. 11 February 2017. Retrieved 11 February 2017. ^ "Vuoden 2018 presidenttipeli vielä auki – he saattavat havitella paikkaa" (in Finnish). Helsingin sanomat. 1 May 2016. Retrieved 1 May 2016. ^ "Vihreille presidenttiehdokas vielä tänä vuonna" (in Finnish). Yle. 21 May 2016. Retrieved 21 May 2016. ^ "Pekka Haavisto kukitettiin vihreiden presidenttiehdokkaaksi - kilpailijoita ei ilmaantunut". Helsingin Sanomat. 12 February 2017. Retrieved 13 February 2017. ^ a b "Europarlamentaarikko Merja Kyllönen suostuu vasemmistoliiton presidenttiehdokkaaksi" (in Finnish). Helsingin Sanomat. 10 February 2017. Retrieved 10 February 2017. ^ "SDP vahvisti jäsenäänestykseen osallistuvat presidenttiehdokkaansa – yllätysnimiä ei tullut". Yle (in Finnish). 29 June 2017. Retrieved 29 June 2017. ^ "Tuula Haatainen Sdp:n presidenttiehdokkaaksi" (in Finnish). Ilta-Sanomat. 2 September 2017. Retrieved 2 September 2017. ^ "Demarin ex-vetäjä: Heinäluoma tähtää presidentiksi" (in Finnish). Ilta-Sanomat. 8 March 2013. Retrieved 17 March 2016. ^ "SDP:n Eero Heinäluoma ei pyri presidentiksi – ehdottaa Urpilaista" (in Finnish). Yle. 21 June 2016. Retrieved 21 June 2016. ^ "Demokraatti: Jutta Urpilainen ei lähde Sdp:n presidenttiehdokkaaksi" (in Finnish). Ilta-Sanomat. 23 February 2017. Retrieved 23 February 2017. ^ "Antti Rinne ei lähde presidenttiehdokkaaksi" (in Finnish). Iltalehti. 15 April 2016. Retrieved 15 April 2016. ^ "Erkki Liikanen haluaa jatkaa Suomen Pankissa" (in Finnish). Iltalehti. 7 March 2009. Retrieved 21 June 2016. ^ "Liisa Jaakonsaari: "Kiva kun pyydetään, mutta en ole lähdössä presidenttiehdokkaaksi"" (in Finnish). Iltalehti. 4 March 2017. Retrieved 4 March 2017. ^ "Sdp:ssä pohditaan kuumeisesti presidenttiehdokasta – vaihtoehtoina ovat myös Sauli Niinistö ja arkkipiispa Kari Mäkinen". Helsingin sanomat (in Finnish). 8 September 2016. Retrieved 8 September 2016. ^ "Erkki Tuomioja: SDP:n vakavasti harkittava, voisiko puolue tukea Sauli Niinistöä" (in Finnish). Yle. 5 June 2017. Retrieved 20 June 2017. ^ "RKP:n presidenttiehdokkaaksi valittiin europarlamentaarikko Nils Torvalds" (in Finnish). Yle. 13 June 2017. Retrieved 13 June 2017. ^ "Carl Haglund presidenttiehdokuudestaan Ykkösaamussa: "Lievä ehkä"" (in Finnish). Suomenmaa. 21 May 2016. Retrieved 21 May 2016. ^ "Haglund jättää politiikan – siirtyy kiinalaisyritys Kaidille" (in Finnish). Keskisuomalainen. 21 June 2016. Retrieved 8 September 2016. ^ "Keskustelu on paikallaan" (in Finnish). Satakunnan Kansa. 24 April 2016. Retrieved 2 October 2016. ^ "Kristillisdemokraatit tukee presidentinvaaleissa Sauli Niinistöä" (in Finnish). Yle. 19 August 2017. Retrieved 19 August 2017. ^ "Paavo Väyrynen neljättä kertaa presidenttiehdokkaana – jos löytyy riittävästi kannatusta" (in Finnish). Yle. 15 July 2017. Retrieved 15 July 2017. ^ "Paavo Väyrynen on saanut kokoon noin 15 000 kannattajakorttia – vielä runsas kaksi viikkoa aikaa". Ilta-Sanomat (in Finnish). 26 November 2017. Retrieved 26 November 2017. ^ "Keskustan jäsen Paavo Väyrynen sai kasaan presidenttiehdokkuuteen vaadittavat 20 000 kannattajakorttia – Vanhanen: "Hän on kilpailevan puolueen ehdokas"" (in Finnish). Helsingin Sanomat. 5 December 2017. Retrieved 5 December 2017. ^ "Uutissuomalainen: Haatainen lähtee presidentinvaaleihin isoimmalla budjetilla – Niinistö ei paljasta vielä". Taloussanomat (in Finnish). 27 October 2017. Retrieved 27 October 2017. ^ "Niinistö pyrkii jatkokaudelle merkittävästi vähemmällä rahalla" (in Finnish). Demokraatti. 28 October 2017. Retrieved 28 October 2017. ^ "Paavo Väyrynen keräsi vaalirahaa yli 160 000 euroa, listassa ei mainita lahjoittajien nimiä" (in Finnish). Yle. 22 March 2018. Retrieved 29 March 2018. ^ "Sauli Niinistö jätti vaalirahoitusilmoituksensa – lahjoittaa ylijääneet rahat hyväntekeväisyyteen" (in Finnish). Yle. 28 March 2018. Retrieved 29 March 2018. ^ "Presidenttiehdokkaat ensimmäisessä vaalitentissä". Ilta-Sanomat (in Finnish). 30 October 2017. Retrieved 30 October 2017. ^ "Matti Vanhanen joutui sairaalaan sydämen rytmihäiriöiden vuoksi – perui osallistumisensa illan vaalitenttiin" (in Finnish). Yle. 13 November 2017. Retrieved 13 November 2017. ^ "Faktaa, tulkinnanvaraisuuksia ja harhaanjohtamista – HS seurasi illan kiivasta vaalitenttiä, täältä löydät mitä puhuttiin ja mikä piti paikkansa". Helsingin Sanoamt (in Finnish). 13 December 2017. Retrieved 13 December 2017. ^ "Presidenttiehdokkaat ensimmäisessä vaalitentissä". Ilta-Sanomat (in Finnish). 30 October 2017. Retrieved 13 October 2017. ^ "Presidenttiehdokkaat kohtasivat Helsingin yliopistolla tentissä – IS seurasi hetki hetkeltä". Ilta-Sanomat (in Finnish). 13 November 2017. Retrieved 13 November 2017. ^ "Presidenttiehdokkaat kohtasivat kolmannessa vaalitentissä – Yle seurasi hetki hetkeltä" (in Finnish). Yle. 27 November 2017. Retrieved 13 December 2017. ^ "Faktaa, tulkinnanvaraisuuksia ja harhaanjohtamista – HS seurasi illan kiivasta vaalitenttiä, täältä löydät mitä puhuttiin ja mikä piti paikkansa". Helsingin Sanomat (in Finnish). 13 December 2017. Retrieved 13 December 2017. ^ "Väyrynen vaalikeskustelussa: Suomi vietiin perustuslakia rikkoen euroalueeseen" (in Finnish). Yle. 14 December 2017. Retrieved 14 December 2017. ^ "Presidenttiehdokkaat vaalitentissä Oulussa" (in Finnish). Yle. 10 January 2018. Retrieved 10 January 2018. ^ "Presidentinvaalitentti Tampereella keräsi salit täyteen: Mitä vuoden 1918 tapahtumista voidaan ottaa opiksi?" (in Finnish). Yle. 12 January 2018. Retrieved 13 January 2018. ^ "MTV:n pöllöraati ruoti suuren presidentinvaalikeskustelun: Hei, vaalien kakkospaikka on edelleen jaossa!" (in Finnish). MTV3. 22 January 2018. Retrieved 23 January 2018. ^ "Nyt ei hyssytellä! IL:n presidenttitentti tänään suorana lähetyksenä". Iltalehti (in Finnish). 19 January 2018. Retrieved 23 January 2018. ^ "Presidentkandidaterna debatterar vapenexport och feministisk utrikespolitik - se Svenska Yles tvåspråkiga valdebatt" (in Swedish). Yle. 22 January 2018. Retrieved 23 January 2018. ^ "Katso IS:n ja HS:n presidentinvaalitentti kokonaisuudessaan". Ilta-Sanomat (in Finnish). 23 January 2018. Retrieved 23 January 2018. ^ "Suuri vaalikeskustelu huipentui väittelyyn pakolaistilanteesta, aktiivimallista ja pandoista – Yle seurasi hetki hetkeltä" (in Finnish). Yle. 25 January 2018. Retrieved 26 January 2018. ^ "Suomi varautuu Venäjän yrityksiin sotkea presidentinvaaleja – puolueet kutsuttiin turvallisuuskokoukseen". Helsingin Sanomat (in Finnish). 28 October 2017. Retrieved 29 October 2017. ^ "Tuomioja lyttää turvallisuuskomitean Venäjä-paperin – haukkuu tekijät "pahauskoisiksi hölmöiksi"". Ilta-Sanomat (in Finnish). 31 October 2017. Retrieved 31 October 2017. This page was last edited on 7 April 2019, at 16:57 (UTC).